The company has two offices open in the capital with three more in the pipeline. 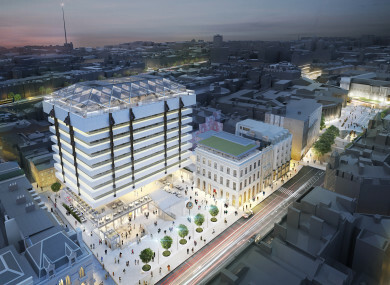 The former Central Bank HQ is to be transformed into a hotel and mixed-used offices. CO-WORKING OFFICE GIANT WeWork has no plans to expand outside Dublin in the near future as it focuses all of its attention on growing its presence in the Irish capital. The company’s head of real estate for Europe, Patrick Nelson, told Fora that WeWork aims to have at least five locations for each city in which it has a presence. It has already hit that mark in Dublin, with two sites already open and another three in confirmed in the pipeline. They include one of the capital’s most high-profile locations: the former Central Bank building on Dame Street, now known as One Central Plaza, all of which will be leased by WeWork. “I personally like to have a minimum of five buildings in any given city, because that’s the moment that members start to recognise that this is something much greater than some office space,” Nelson said. He added that he had no concerns about finding suitable properties for WeWork to grow further in Dublin, despite high demand for office space - particularly among tech firms. “We’re always interested in expanding our community, but for the time being the focus is on Dublin. WeWork has 6,500 ‘members’ signed up for its sites in Dublin, although it deploys fewer desks as the figure also includes workers on hot-desking setups. It has leased around 30,000 sq m of total space across the five offices, while the company is believed to be hunting for more locations in the city. WeWork, which was founded in 2010, started with a view to providing office facilities to startups and small businesses unable or unwilling to take out long-term leases. However 500 offices and a $20 billion valuation later, the US company has wholeheartedly opened its doors to large businesses and enterprises. Microsoft and tech firm Twilio now occupy swathes of space in its Dublin buildings. Nelson said that enterprises account for around 30% of its network globally today and that will increase to more than half eventually. An increasing number of WeWork members were also opting for agreements for periods of longer than 12 months, he added. “Dublin is a very healthy market for us in terms of enterprise,” he said. Despite the large presence of multinationals in its offices, Nelson said that the company would ”always remain true to the entrepreneurs, smaller businesses and startups”. He said that many larger firms in WeWork offices find it easier to attract and retain talent, collaborate with other companies or use the spaces as a means to set up a base in a new market. “You see a lot of large businesses wanting to behave like small companies, and I think a lot of small companies now look at large businesses to understand their relevance and best practice,” he said. In recent years, Dublin has seen an influx of co-working spaces, including Huckletree and Talent Garden, which recently opened on DCU’s campus. These are on top of long-standing facilities like Dogpatch Labs, in the CHQ Building. Commercial property specialists CBRE predicted earlier this year that flexible workspace providers like WeWork and its competitors were likely to be the winners of Dublin’s office space shortage as firms looked to expand their presence in the capital. Nelson said WeWork was “very aware” of its rival operators, however he said offering physical space was only one part of its pitch to clients. “Over half of our members are actually entering into business transactions with other WeWork members,” he said. Email “Hot-desk giant WeWork has a spot in the new One Central Plaza but no plans outside Dublin yet”. Feedback on “Hot-desk giant WeWork has a spot in the new One Central Plaza but no plans outside Dublin yet”.